Today I am featuring a plugin that took the number one spot in July’s Plugins of the Month post. There are two reasons why I feel that this plugin deserves another mention. The first reason is that every WordPress blogger should know about it, because it makes blogging with WordPress so much easier. The second reason is that since being featured back in July, the plugin has been updated with all sorts of cool features. 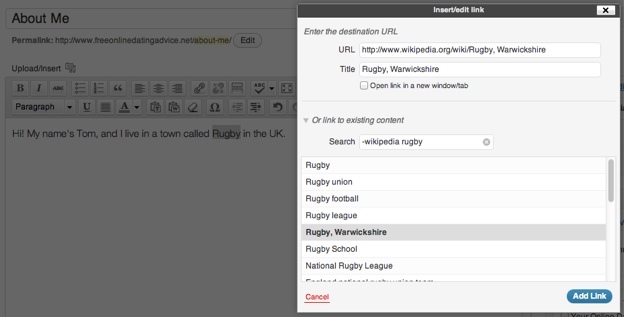 For those of you who are wondering what I am talking about it, the plugin in question is Better Internal Link Search. At ManageWP, we’ll happily spend all day talking about how much we love WordPress. But we do not claim that it is perfect. I think everyone can point out to that one bug or lack of functionality that irritates them when it comes to using our favorite content management system. For me, my irritant was search. For some reason, WordPress fails monumentally when it comes to search in every format — on the front end, on the back end, and even when searching for internal posts and pages to link to from within the visual editor. I soon discovered that Relevanssi was the best solution for both front and back end search in WordPress. That just left internal link search, which was still woefully lacking. The reason why default internal link search in WordPress is so bad is because it takes your keyword and searches through every post and page’s headline and content, without any weighting for relevance or importance. Then it sorts every post and page it finds that includes your keyword, and lists them in reverse chronological order. What this means, as you can see from the above screenshot, is that the search function tends to return a largely (or wholly) irrelevant list of posts and pages. When you have a blog with a large number of posts and pages, trying to link to anything internally becomes a laborious process. Instead of using WordPress’ search feature, I would end up searching through my own blog to find the post, then copying and pasting the post’s URL and title. Not exactly efficient. Better Internal Link Search was initially released to achieve one simple goal — to make searching for internal posts and pages easier. And it achieved this in such a simple way, you have to wonder why it isn’t included in WordPress by default. Rather a more relevant set of results, don’t you think? If you think about it, when you intend to link to an internal post or page, you will always know at least a fragment of its headline. And that is all you need in order to find it. But that’s not all — Better Internal Link Search has been updated with a bunch of additional features. First of all, taxonomies are included within search results, which means that you can link directly to categories and tags from your post or page content. Secondly, you are able to link to scheduled posts which have not yet been published. This is a great feature for any blogger who likes to schedule posts out in advance. Pretty cool, right? You can also link to your homepage just by typing in “home” and clicking on the result displayed. 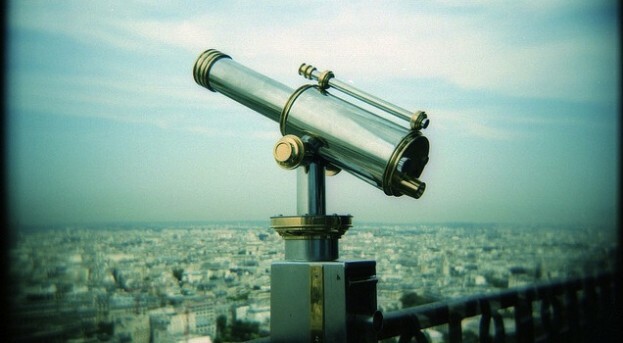 Better Internal Link Search is a true diamond in the rough, and in my opinion is the most underrated plugin available on WordPress.org, with just 500 downloads and 5 ratings. 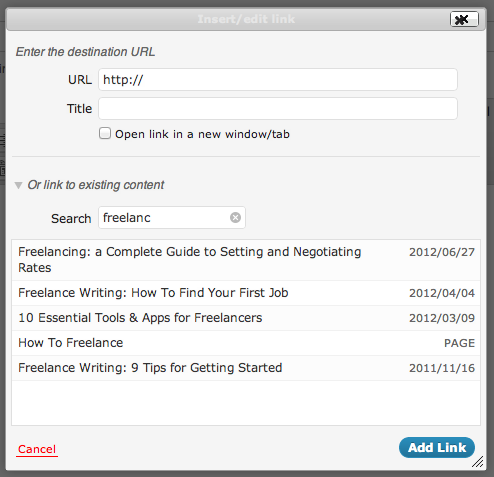 Any WordPress blogger with more than a handful of posts will find that linking internally is a whole lot easier with this plugin! Great article, Tom! 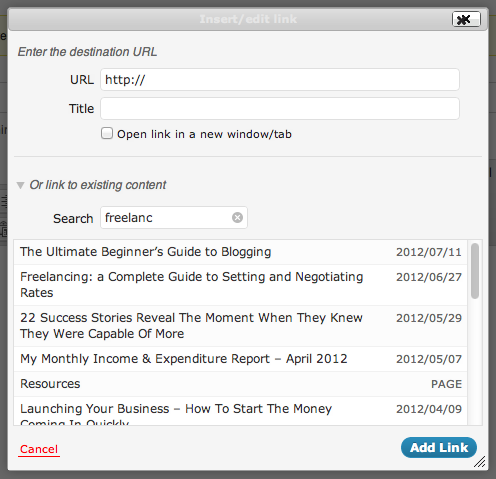 Better Internal Link Search is one of my “must-have” plugins. How does it compare to Relevanssi? They’re not comparable plugins — Relevanssi doesn’t affect your internal link search on post pages. Couldn’t agree more about the Better Internal Link search WP plugin. I especially like that it doesn’t appear to tax the server or slow my site while yielding much better results–and experience on my site–for my visitors. Yup. I just can’t believe it’s not getting more downloads — I see it as a must-have plugin for any blogger with more than say 20 posts.